I combined various art “isms” — Baroque Classicism, Medievalism, and Conceptualism. The painting behind the forefront window panes is a scene loosely based on Vermeer’s painting the Music Lesson. [Baroque Classicism]. In this room I put a mirror on the wall, echoing Tennyson’s poem The Lady of Shalott. This Victorian poem is based on an Arthurian legend [Medievalism] written in 1832 where a lady has a unique curse placed on her. She cannot look directly at the world — she looks in the mirror instead. 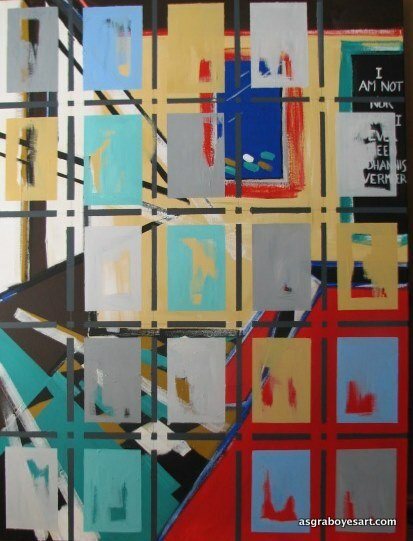 The statement “I am not now nor have I ever been Johannes Vermeer” based on a phrase often used by conceptual artists. It’s true. I will never be Johannes Vermeer.